Where Does Chicago’s Garbage Go? 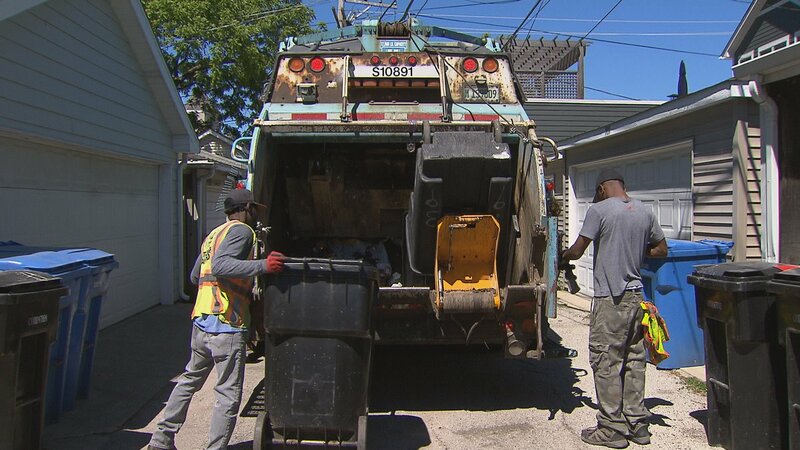 Chicagoans dump more than 800,000 tons of garbage into their black city garbage bins every year. We wanted to find out what happens to all that garbage once it leaves the alley, so we followed the trail out to landfills the city uses and found them to be far different than the old city dump. Elizabeth Brackett: City garbage trucks roll through the city’s alleys and streets every weekday. The sanitation laborers pick up nearly 900,000 thousand tons of garbage every year. And that’s just from the 600,000 residential customers who live in homes and buildings of four units or less. The garbage is picked up on the grid system now rather than the old ward-based system. Charles Williams, Department of Streets and Sanitation Commissioner: Instead of working in 50 wards, we are working out of eight divisions, and it’s much more efficient. Brackett: Once the trucks leave the alley, most Chicagoans have no idea where their garbage goes. The first stop is at one of 11 transfer stations around the city. This one near Clybourn and Ashland avenues is busy from early morning until midafternoon. Each truck contains five to eight tons of refuse picked up from the city’s black garbage cans. Backing up to the ever-growing pile, the trucks disgorge thier contents. No sorting or compaction is done here at the transfer station. Instead, bulldozers pile up the incoming trash until it is scooped up and dumped into waiting transfer trucks. This transfer station is owned by the city, but the garbage is the responsibility of Republic Services, a waste management company that has a contract with the city. Republic Services manager Brian Holcomb says transferring the garbage into semis is the most efficient way to move it to landfills. Brian Holcomb: What we do is load the smaller trucks one the larger truck, which reduces fuel consumption, over-the-road wear and exhaust emissions. Brackett: Once filled, the transfer trucks hold about 25 tons (or 3 garbage trucks’ worth) of waste. After they are weighed, they are off to one of the four landfills used by the city of Chicago. All four are roughly 100 miles outside the city, two in Illinois and two in Indiana. The 550-acre Livingston landfill, near Pontiac, Illinois, is owned and managed by Republic Services. Transfer trucks lumber up to the top of the active part of the landfill. It doesn’t take long for the trucks to dump their 25 tons into the pit. As soon as it lets loose, the heavy equipment below takes over. Bulldozers move the garbage into place while huge compactors mash the garbage into the pit. The landfill takes in an average of 5,000 tons of garbage a day. The freshly dumped garbage is covered with dirt every night to prevent waste from blowing out of the landfill. But this landfill is not just a bottomless pit. Landfills are now highly engineered. In 1990, the U.S. Environmental Protection Agency began requiring that all landfills contain the waste to prevent contamination of soil and groundwater. The process begins by digging a pit and putting in an initial layer of nonporous clay. Holcomb: This is our next sequence of development, and we call it a cell. It’s about 10 acres in this case, and what you can see from where we stand is the earthwork recompaction in progress. So what’s closest to us is clay that’s been recompacted, it’s been excavated from an adjacent area to our north here. And then they’re preparing the subgrade for future compaction on beyond it. Holcomb: Once the clay has been certified, recompacted and it has met its permeability standard, then we will begin the synthetic lining process. So what you can see in the distance over there – the large rolls of material – that will be deployed and seam welded across the entire footprint of this cell. Then once that’s in place, we’ll put in what we call the flow zone or the drainage blanket. It’s a high-permeability sand layer that allows the liquid to flow to the low point of the cell, which is in the far corner over here to the west. Brackett: And that liquid gets taken off and sent to a treatment plant? Holcomb: That liquid would be extracted on a continual basis when its produced and pretreated, and then sent to the public-owned treatment works. Brackett: When the 10-acre cell has been filled with garbage – which takes about a year and a half – the plastic liner is pulled over the waste and sealed, soil is added and grasses planted. Critical to protecting the environment is the EPA requirement that all the methane gas released from the decomposing garbage be captured. At the Livingston landfill, 310 methane gas extracting devices cover the filled areas. Holcomb: There’s no smell because all of the gas is collected through what we call a gas extraction system. We’re able to hook our instrumentation on this and understand how much gas is moving through the device, what its temperature is, what its moisture content is. Brackett: So it’s being pulled from the garbage below and then sent to where? Holcomb: It’s sent through this pipe down to our gas-to-energy plant. There’s a compressor that’s running and pulling vacuum on this device. This straight down into the waste is 100 feet or so – it’s like a well. It’s perforated, and there’s gas moving into it up through here, through this pipe and onto the plant where electricity is made. Brackett: The energy plant turns the captured methane gas into electricity, which is sold on the electrical grid. The Livingston energy plant, owned by Hoosier Power, produces enough electricity to supply the equivalent of 10,000 homes with energy. In 2016, the city paid $36 million to dispose of its garbage. That’s about 20 percent of the overall cost of handling the city’s waste. It would be cheaper and better for the environment if Chicago recycled more of its waste, says Streets and Sanitation Deputy Commissioner Christopher Sauve. Christopher Sauve: Economically, it makes total sense for the city: The more we divert into these blue carts, the less material that’s going in to those black carts that we actually have to we have to pay to dispose of. The advantage you get with recycling is being able to reuse those materials, so you’re not using virgin materials. That’s where you get a huge environmental benefit. Brackett: The Livingston landfill is at 68 percent of its capacity. It has just more than 20 years before it will be completely full. At the current rate, the Illinois EPA says the whole state will also run out of space for garbage in the next 20 years. Despite the strict regulations on the release of methane from landfills the EPA reports that landfills today are the third-largest source of methane emissions in the U.S. On Tuesday, our series Tracking Chicago’s Trash continues as we look at Chicago’s efforts to reduce the amount of garbage it sends to landfills by stepping up the city’s recycling program. June 26: From lost jewelry to criminal evidence, a Pontiac landfill that receives trash from Chicago has plenty of bizarre waste stories. June 26: About 5,000 tons of trash from the Chicago area is dumped every day at a landfill in Livingston County, but hardly any of it goes to waste. How yesterday’s trash becomes tomorrow’s energy.